The media largely stuck to the conventional wisdom that economic anxiety helped drive support for President Donald Trump during the 2016 election. The only problem? It isn't true. The real reason voters flocked to the former reality star candidate actually lies in "status threat, not economic hardship," says Diana C. Mutz, a political science professor at the University of Pennsylvania and the author of a new study that debunks the notion that economic anxiety was the reason for President Trump's victory. For the first time since Europeans arrived in America, she says, white Americans are being told they will soon be in the minority. And because "there is a tendency to think of power and status as something that's kind of zero sum," Mutz told CNN's Brian Stelter, those that the study bills as "traditionally high-status Americans" -- like whites, Christians and men -- may think that their status is under threat if opportunities are created for minorities to advance and succeed. "The sheer idea of losing social and political power, or needing to share it with other groups, is something that they haven't had to deal with before now," Mutz explained to Stelter. There's appeal in a candidate like Trump whose slogan "Make America Great Again" implies a return to a previous status quo. 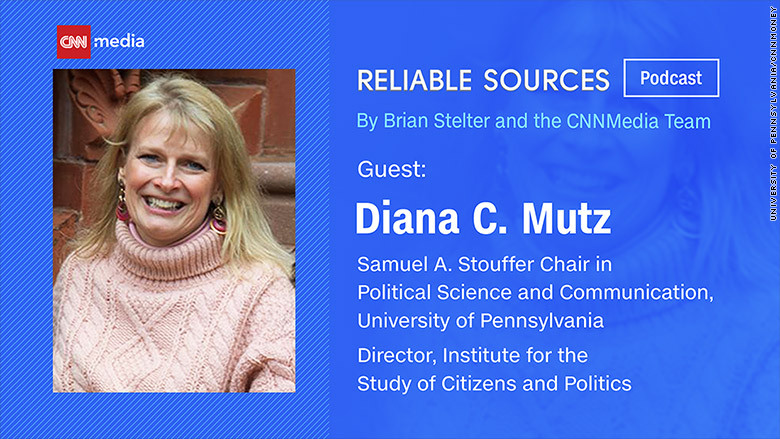 Mutz parsed through the details of her findings for this week's Reliable Sources podcast. Mutz's study, published in the Proceedings of the National Academy of Sciences (PNAS), attempts to explain why those who voted for the Democratic candidate in 2012 would then vote for the Republican candidate in 2016. One of the common narratives -- that citizens who were "left behind" economically would gravitate towards the party not in power -- didn't materialize in Mutz's findings. "Over many decades of scholarship, evidence of voters politicizing personal economic hardship has been exceedingly rare," the study says. And, the economy was actually on an upswing leading up to the 2016 election, Mutz said. So why would journalists buy into economic explanations? Mutz's study says it may have to do with data indicating lack of college education as the strongest predictor of Trump support. "When journalists analyze these data, they usually look at bivariant relationships, you know, how are people voting relative to one characteristic of them," Mutz told Stelter. "Education is also highly correlated with things like racial attitudes and with more sexist attitudes as well. So how do you tell the difference between education or income and these other kinds of attitudes? It's very difficult to do, and often journalists don't have the resources to do that either." Mutz said social scientists can do more to help journalists gain insight into voter behavior. "It's also a failure on the part of social scientists in that our work tends to come out so slowly that it's difficult for the press to distribute the best possible explanations after political scientists have had time to look at the data," she told Stelter. With midterms approaching and the next presidential election just two years away, Mutz recommended journalists "be a bit more cautious about rushing in and embracing a particular narrative as the explanation for election outcome." "I think it's great when academics have more interaction with journalists to help provide alternative narratives, and it will take some time to sort them out, that's for sure," she said. "We often have so many explanations that no one really knows exactly what happened. But in the long run, it's important that we understand what the people are saying when they vote the way they do."